as part of the C.R.A.S.H division. All three CRASH skins are now taken. Danny Lawrence (MJO) has resigned from his position as a police officer. Rayan McConors (LA) has joined the SWAT division as a member. Rufio Caslione ([PD]Rufio) has resigned from his position as a police officer. The LSPD wish you good luck in chasing cows in Dillmore. Eddie Pulaski ([PD]Black) has joined the SWAT Division as a member. event was very unusual and the chances of a risk situation emerging were high, therefore the mayor was escorted and protected by numerous police officers from the LSPD, as well the SWAT. After the incoming crowd settled in front of the motel, the mayor was ready to begin when suddenly a shot flew by and caught him, collapsing his body. Following which, he was quickly rushed inside an ambulance and transported to the All Saints Hospital where he passed, while on scene officers fled the surrounding blocks, searching for the shooter. After a quick operation launched, the LSPD can honorary inform that they have caught the shooter and placed him under arrest, after which he would be facing a "speed" trial. More information to be released soon. The whole LSPD offer their condolence to Richard Bradley's family. 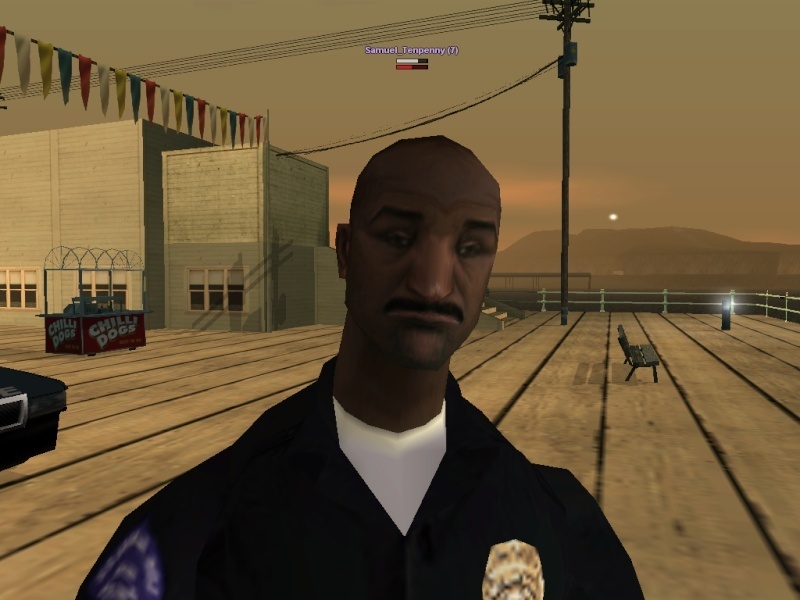 Dio Fiely, the LSPD wishes you good luck in future work. The Los Santos Police Department was the target of a planned riot attack today, around the hour of 13:00. A Los Santos radio broadcast a speech by a man, informing all listeners to appear in front of the Commerce located police department building for a planned attack. After the quick reaction from the LSPD's side, Riot and Crowd Control (RCC) units took their positions outside of the building in await. After many more people gathered at the location, they attacked. The brave police officers managed to get control of the situation, blocking any attacks with their actions, injuring many civilian attackers. After a five minute brawl, the rioters fell back and dispersed, with only the injured of them remaining down. The RCC unit was led by Commander Boris Ivanov. Further investigations on the radio broadcast subject will be made from the CID's side. 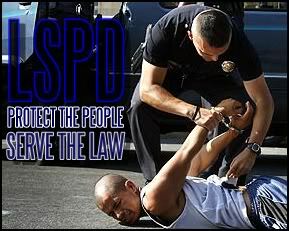 The LSPD sends its best wishes for the future work. [PD]Black/Eddie Pulaski has been promoted to the rank Police Officer II. [PD]Jimmy/Jimmy Smith has been promoted to the rank Police Officer II. [PD]Jimmy has changed his name to [PD]White. [PD]Strike has changed his Roleplay character to Bastian Rommel. [PD]Black has changed his Roleplay character to Frank Tenpenny. [PD]White has changed his Roleplay character to Eddie Pulaski. The 'SWAT Deputy Commander' position has been added inside the SWAT division. The 'Head of CID' title has been changed to 'Chief Inspector'. After a riot towards the LSPD, Riot and Crowd Control officers were called in to prevent by last information, an attempt for a prison brake out by the civilians. Many people gathered in front of the police station in an attempt to attack and free prisoners located inside the police building. Despite a few people managing to get in the prison cell area, the LSPD officers placed the situation under control with no lethal force used and block all attacks. After the brawl, most of the civilians dispersed, while others were injured or arrested. LSPD reports that there were no casualties from the law agency's side and almost all officers are in a near perfect condition. Today the LSPD officially launches the Traffic Enforcement Division, which will control any traffic related actions such as issuing driving licenses, vehicle towing and impounding, traffic pursuits and general traffic ticket procedures. This happens due to the latest traffic problems throughout the city which the LSPD encounters. The head of the division will be selected in the upcoming days and put in charge. Commander Boris A. Ivanov, officially announced his resignation from the LSPD today. He will be transferring to the Boston Police, where he will take the position of a Deputy Chief, accepting the request from their side. Commander Ivanov wishes good luck to the whole department and its officers in future work. This decision sets the SWAT Commander place available, as a new person will be selected to lead it immediately. Daniel Westbrook is now the Chief Inspector of the CID. Senior Lead Officer Jake Connor ((Domino)) has been promoted to Sergeant. Jake Connor ((Domino)) is now the SWAT Deputy Commander. Rufio Caslione ((Rufio)) has been reinstated into the LSPD as a Police Officer I. [PD]Black has resigned from the LSPD. The Frank Tenpenny skin and Head of CRASH position are now available. [PD]White has now taken the character of Frank Tenpenny and the Head of CRASH position. Eddie Pulaski skin is now available. [PD]Jackson has changed his character to Eddie Pulaski. All CRASH skins are now taken. We have a new member. [PD]Jason, the LSPD wish you good luck in future work. SWAT titles added to the information topic. The LSPD reports that today's CID undercover operation left one dead and three arrested, by the law agency, with no police casualties on the side. Earlier today, undercover detectives fled around nearby Willowfield and Playa Del Seville for an undercover operation, aiming for steadying the illegal guns flow in the neighborhood. [PD]Agger, the LSPD wish you good luck in future work. [PD]Ghero has changed his character. The Jimmy Hernandez skin and position is now available. [PD]White and [PD]Agger have joined the SWAT division as members. [PD]White and [PD]Domino have earned the bravery medal for their undisputed act of heroism while on duty.